"CSIT4Aid" - the CSIT Solidarity APP. CSIT would like to draw everybody's attention to the startup of the “CSIT4Aid” - App, which is one of those projects lying close to President Molea's heart. “CSIT4Aid” is a tailor-made app, designed in-house, which is aimed at fundraising for the needs of our poorest athletes and sports organisations. Solidarity is for our benefit and a very important attitude in our movement, which is as old as the CSIT! According to his vision Bruno Molea presented in his Congress speech 2017, that often there are on the one hand member unions or potential CSIT members coming from poorer countries or are in economic difficulties, which can not participate personally at CSIT sports - events (World Sports Games, International Single Championships, courses, trainings, projects ...), because they do not have enough financial resources to support their athletes and participants. Objective 1: We want them at the next CSIT World Sports Games 2019 in Tortosa and the following editions! On the other hand there are also member unions that can provide high level of technicians’ or management expertise, but their specialists can't be appointed, because their member unions can't economically support them for their mandate in CSIT's leading postions. Objective 2: We want the best experts in CSIT! The “CSIT4Aid” - App was designed to accomplish this presidential aim, in order to run solidarity campaigns to allow people from all over the world to transfer easily money by their mobile in order to sustain the CSIT Solidarity Fund. The goal in this matter is to get a friendly-tool, easy to use, immediate to motivate athletes and sports organisations all over the world. Everybody can download onto the mobile phone via App Store (Apple) and Play Store (Google), searching for “CSIT” (the app is named “CSIT4Aid”). 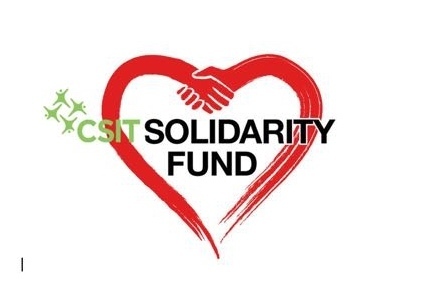 Possible donation is from 1 Euro upwards according to the supported CSIT Solidarity Campaign, or simply to donate to CSIT Solidarity Fund. The registration can be done quickly in the CSIT4Aid – App or through Facebook. This tool is strictly compliant with all actual data protection regulations. Every single person can easily take part, even the smallest contribution can play a big role! President Molea finally emphasizes that if the CSIT - as a social and democratic organisation - will not find a way to help those organizations, they could fail to achieve one of the most important objectives, which is to allow the poorest and deprived people to practice popular sport in a cooperative spirit and friendly atmosphere; for the poor or developing countries sport representatives in fact a key-tool for a social rescue, for socialization as well as integration and for the developing of global citizenship. At the CSIT Congress 2018 will be the official launch of the Solidarity App Project, application criteria introduced, involving also the call for proposal for candidates.